Saturday, Dec. 7 from 10 a.m. to 3 p.m.
Make this fun, free community event your holiday tradition. Enjoy vendors selling holiday gifts and crafts, free self-guided tours of the Mansion, free games with prizes, roaming entertainment, school choir performances, holiday storytime, and horse-drawn hayrides. Refreshments will be available for purchase. No on-site parking is allowed. Off-site parking will be available with shuttle buses to the Mansion beginning at 9:30 a.m. This all ages event is free and no reservations are required. 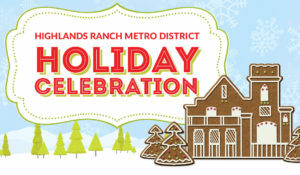 Please call the Highlands Ranch Metro District with any questions at 303-791-0430.